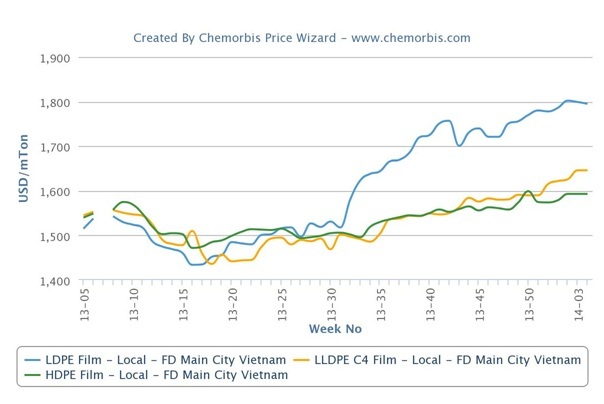 In Vietnam, buyers complained about the fact that local PE prices have been rising despite the fact that demand is slower now ahead of the Chinese New Year holiday as per the pricing service of ChemOrbis. 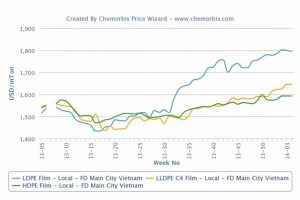 In fact, local PE prices are at their highest levels in a year. Players attributed this situation to tight local supplies. This stems from restricted import purchases recently due to distributors’ narrow margins. Distributors complained that after purchasing imports at increasingly higher levels, and then paying the localization costs on top of the import prices, left them without any profits after selling in the local market. Apart from this, many overseas producers from the Middle East and Southeast Asia had elected to divert their cargoes to China over the past several months because of rising prices into that country, which netted better gains for overseas suppliers relative to other markets. Import PE prices given to China also hit year – high levels very recently as the Chinese market remained strong. This has been the case especially since October 2013, as the firm sentiment was further boosted by flooding caused by Typhoon Fotow. Flooding reportedly soaked some polymer warehouses in the cities of Ningbo and Yuyao. This situation attracted additional quotas from overseas suppliers to the country. Another trader located in Vietnam confirmed the weak local demand since most buyers have already started to leave the market for the Chinese New Year. However, the trader added that they, too, do not expect any decreases given the supply issues.